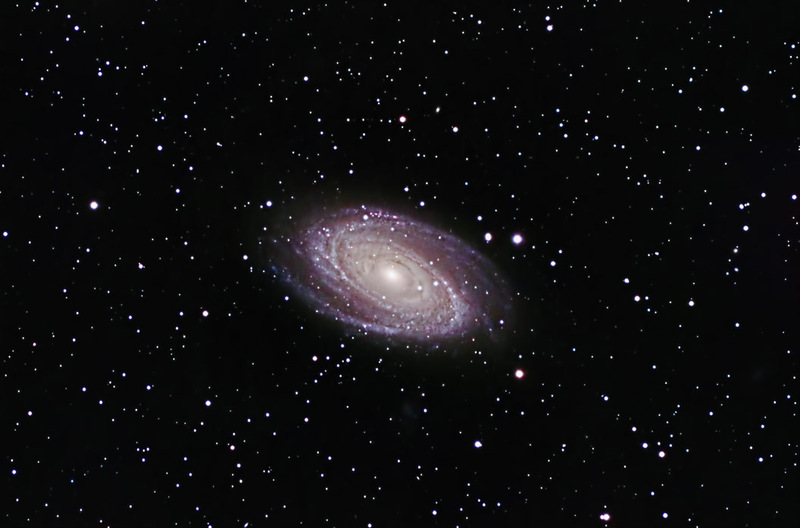 M81 is a spiral galaxy that is located approximately 12 million light years away, in the constellation of Ursa Major. It is also known as Bode's Galaxy as Johan Bode reportedly discovered it in 1774. Pierre Mechain and Charles Messier re-identified it in 1779 and placed it in Messier's catalog of deep-sky objects. It has a very active core that is believed to contain a super-massive black hole. Exposures: 17 @ 5 min. Images were focused using the camera's live view. They were calibrated, aligned, and combined in ImagesPlus. The composite image was adjusted in Photoshop. Sharpening and noise reduction were done using Topaz Detail and DeNoise respecitively.